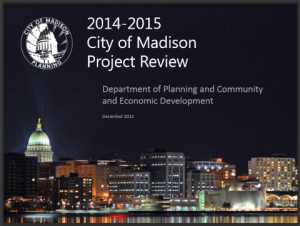 The City of Madison has released it’s 2015 Projects In Review Report put together by the Department of Planning and Community and Economic Development. Welton is excited to have a couple of its projects included. Developed at 9414 Silicon Prairie Parkway in Silicon Prairie™, a McKenzie apartment development is shown on slide 15. Featured on slide 31 is Watermark Lofts on John Nolen Drive, a mixed-use building developed T.Wall Enterprises, LLC. in conjunction with Welton. Congratulations to the City of Madison for a tremendous 2015 and a promising 2016!